Wedding season is here. So you need a drink, right? Fortunately, we have just the thing. 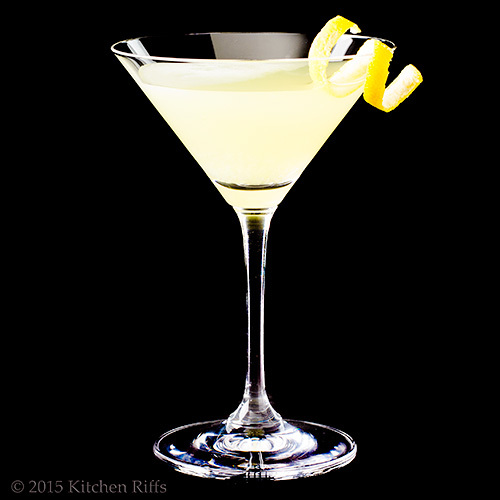 The White Lady has a crisp, lively flavor that’s perfect for warm weather. It features a hint of sweetness, but not too much. So it will whet your appetite for that overpriced reception dinner. And help you endure Uncle Harry. That’s our kind of white wedding. 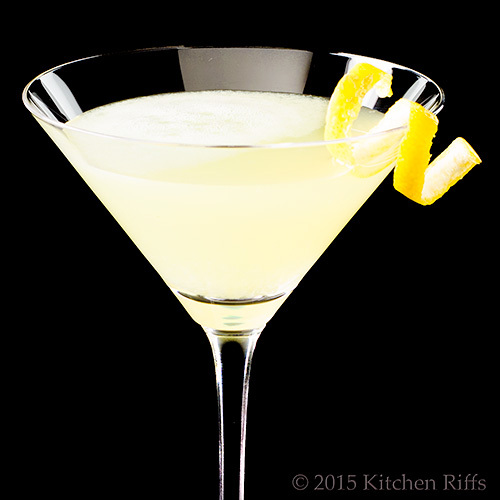 The White Lady combines gin, Cointeau, and fresh lemon juice. It’s kinda sorta like a gin Sidecar (which uses brandy as its spirit). 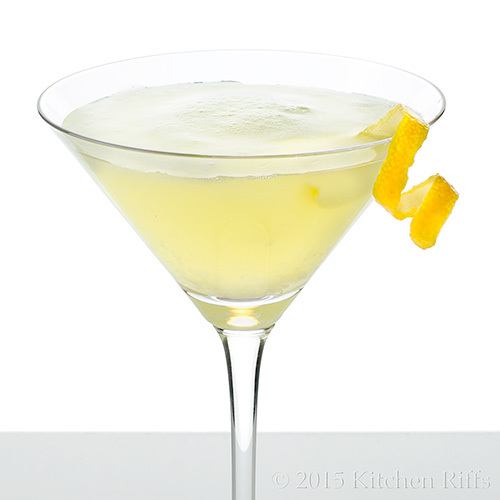 Many bartenders include egg white when they mix a White Lady. The egg white doesn’t add flavor, though it does give the drink more volume and a fuller body. But it’s totally optional. Place all ingredients (except garnish) in a cocktail shaker half-filled with ice. Shake hard for 20 to 30 seconds until the shaker is nicely frosted. Strain into a cocktail glass, preferably one that has been chilled. Garnish with a lemon twist, if desired, and serve. 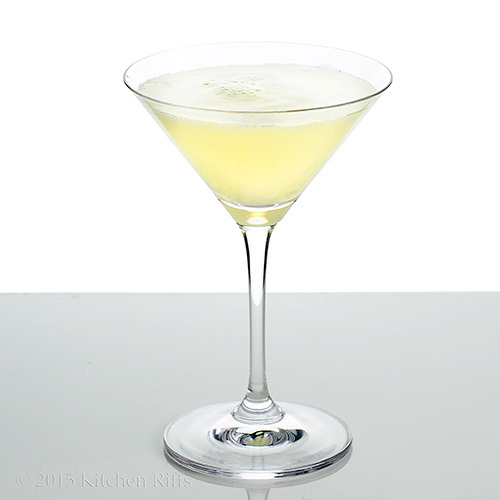 This drink is most commonly served in a cocktail glass, but it also looks great in a champagne saucer (particularly when it includes egg white). When mixing any drink that contains egg white, you might want to start by putting the egg white in the shaker by itself, without ice. Shaking sans ice helps develop frothiness. Shake the egg white for 30 seconds, then add ice and proceed with Step 1. Eggs carry a slight (but real) risk of salmonella. So you may want to consider using pasteurized eggs. Although it’s unlikely that the eggs you buy will be infected, why take the risk? You can also use dried egg white powder. Supermarkets usually stock this in the baking aisle. As long as you thoroughly dissolve the powder in warm water before using, it works well in cocktails. BTW, when we mix this drink with egg white, we use only one white, whether we’re mixing one drink or two. When a cocktail recipe specifies gin, it’s usually understood to mean dry gin. “London” dry gin is the most common style (it originally was distilled in London), but there are other styles of dry gin that are fairly similar (Plymouth gin, for example). Don’t stress about whether a particular gin is London dry. Just buy a decent dry gin with a name label. The White Lady Cocktail goes by many different names. You may see it called the Delilah, the Chelsea Sidecar, the Kiernander, the Janikedvence, or Lillian Forever. Same drink, different aliases. You may also find other drinks called the “White Lady” with ingredients and recipes that differ markedly from this one. But that’s typical for the world of cocktails, where confusion reigns. The version of the White Lady that we feature here derives from a drink that most likely was created by Harry MacElhone, who earned his chops at the Plaza Hotel in New York, and later founded Harry’s New York Bar in Paris. MacElhone is credited with creating several other famous drinks, including the Sidecar, the Monkey Gland, the Bloody Mary, and the French 75. Some cocktail historians say that MacElhone first mixed the White Lady in 1919, when he worked at Ciro’s Club in London. Originally, he used crème de menthe (which sounds awful in this drink). He later came to his senses, and replaced that with gin when he served it at Harry’s New York Bar. He also served a brandy version of the drink at one point. Other cocktail aficionados insist that the White Lady was invented by Harry Craddock at The Savoy Hotel in London. Maybe. But most people today credit the drink to MacElhone. Wherever and whenever it was created, it was a very popular drink between the world wars. It’s said to have been a favorite of comedians Laurel and Hardy. Dorothy L. Sayers’s famous sleuth Lord Peter Wimsey drinks a White Lady in her mystery novel Have His Carcase. In John le Carré's The Looking Glass War, spy Fred Leiser favors the White Lady as his tipple of choice. Programming Note: Now that Memorial Day has come and gone, it’s time to start our annual Summer Sippin’ and Snarfin’ Series. What’s that, you ask? Well, during most of the year, we publish one cocktail recipe a month (on the first Wednesday). But when summer rolls around, we tend to up our drinks quotient – because we all get thirsty in warm weather, right? So expect to see lots more cocktail recipes through Labor Day, along with summer-appropriate food dishes. We may even post back-to-back cocktails. Skoal. “They were quite a sight in their fire hats and boots,” I said. “But we finally made it through the throng and got to the judge’s chambers,” I said. “And we thought he was sitting behind his desk when we walked in,” said Mrs K R.
“By not looking each other in the eye until we stepped outside,” I said. “At which point we collapsed into giggles,” said Mrs K R.
“You have to admit, it was a fitting start to married life for the likes of us,” I said. What a beautiful drink to toast the bride and groom! Your cocktail ideas are always so sophisticated sounding, like a Nick and Nora Charles movie. I wonder what they drank. Ok I checked and they drank martinis. But this makes me think of them. Hi Karen, isn't this nice? Really tastes great -- this is a new favorite. Thanks for the comment. Hi Mae, yup, Nick & Nora were definitely martini types. But they'd have loved one of these. :-) Thanks for the comment. This looks like such a classic cocktail. I love the idea of drinking it while at a fancy event. OH, what a cute story! And a perfect drink to toast the newlyweds. Hi Laura, this is really, really good. Definitely one I think you'd like. Thanks for the comment. Hi Nazneen, we loved our wedding! Totally perfect for us. :-) Thanks for the comment. I was recently at a vodka tasting and most of the other attendees were bartenders. While some relied on the latest craze of adding everything but the kitchen sink to their latest and greatest, I loved that the brand stuck to what I know...3 or 4 great ingredients is all a good cocktail really needs. This is the perfect example and a must try for me! Past, present and future - that covers them all! This is a beautiful drink - and a must try because I feel the need to give gin a second chance :) Have a lovely week! What an interesting name for a cocktail. It is beautiful and classy though. Cheers!!! Interesting drink. I would have never thought to add egg whites. So is that meringue powder that you use in place of a raw egg? Wedding season ain't here yet for me! ;) THANK GOODNESS - I still have a lot of things to take care of! Hi Barb, you'll love this! Really a good drink. And I agree about the number of ingredients -- usually less is more. Thanks for the comment. Hi Tricia, you really do need to give gin a second try. It's truly good stuff. :-) Thanks for the comment. Hi Denise, isn't this a fun name? Have no idea exactly what prompted the name, but who cares! Thanks for the comment. What a cute story and a special cocktail. I see if I can find one when I'm attending my niece's wedding in Germany. Prost! Hi Viciki, I almost always use an actual egg white in a drink like this, but sometimes use powdered egg whites. Which of course you can use to make meringues. Not sure if they're the same thing as meringue powder though (doesn't meringue powder contain cornstarch and other ingredients, whereas powdered eggs whites are just that?). Anyway, egg whites work really well in some drinks -- they add really nice texture. Thanks for the comment. Hi Pat, this drink is just in time for your planning. :-) Thanks for the comment. Hi GiGi, it'll be here before you know it, though. :-) Thanks for the comment. Hi Gerlinde, this is so worth trying. Really has nice flavor. :-) Thanks for the comment. Love this! The perfect way to kick off a series of more drinks. This sounds so light and refreshing! You prepare and shoot the most elegant cocktails. Another winning recipe in my book and I would like a glas now. See I am tired and I read "toasting briBes" at first lol and went huh?? Hi Mary, this has wonderful, crisp flavor. It really is extremely refreshing! Thanks for the comment. Hi Evelyne, this IS a winner! Super flavor. And briBes is pretty funny! Thanks for the comment. Hi Merryn, we had what we consider the best ever wedding. :-) This is a super drink -- you'll like it, I'm sure. Thanks for the comment. This is one gorgeous cocktail! I still desperately need a tutorial on making a lemon twist---you sure have the knack!!! Wedding season is truly here - I'm getting married in a few months! This sounds like the perfect cocktail for us to serve especially given there is Gin involved. Hi Liz, quick tip on making twists: cut the twist (it's easiest to do this with a channel knife). Wrap the twist tightly around a round spoon handle or chopstick. Hold each end of the twist, and push the ends towards the middle slightly (this helps set the curl). That's it. :-) Thanks for the comment. Hi Louise, yup, I was humming White Wedding as I was taking the photos. :-) Thanks for the comment. Hi Kushi, isn't this nice? :-) Thanks for the comment. Hi Amanda, this would be perfect for your wedding! Are you having firemen at yours, too? :D Thanks for the comment. What a beautiful drink. So elegant. Hi Lizzy, this really does look pretty, doesn't it? Lovely drink. :-) Thanks for the comment. Wow! I am definitely a cocktail lover and this is such a beautiful looking one. And that lemon twist is just to pretty. Would give it a try! Hi Dottie, isn't lemon wonderful? Love it in anything, but it's particularly nice in cocktails and desserts. Thanks for the comment. Hi Kristi, let's all celebrate! :D Thanks for the comment. HI Anu, lemon twists dress up any drink, don't you think? And this one deserves to be dressed up! Thanks for the comment. You're making me want to ditch my wine glass and become more acquainted with mixed drinks. Love these posts John. Hi Lea Ann, we're mainly wine drinkers, but love to start things off with a cocktail. So many, and so many are really good. Like this one! :-) Thanks for the comment. Hi John, I've never heard of The White Lady before, sounds like a lovely drink. Love, love your wedding story. My husband and I were married at the courthouse too, but do not have quite the story you do. Great post. I use to be a gin & tonic person, but got bored with them after several years. Have never found another gin cocktail that really appealed to me, until now. I love Cointreau, so with gin and Cointreau this is obviously a drink for this white lady. :) Thanks for introducing me to this cocktail John! Hi Cheri, our wedding was a hoot, wasn't it? And yes, this is a wonderful drink! Thanks for the comment. Hi MJ, there are some boutique tonics out there that are really worth trying. Although I know what you mean -- it's kind of a one dimensional drink. This one is wonderful -- you'll like. Thanks for the comment. I like the idea of adding an egg white. And yes, sooo many weddings this time of year! I think we have almost every single weekend. Hi Greg, nice, isn't it? A new fave of ours. :-) Thanks for the comment. Hi Ashley, egg white really adds wonderful texture to drinks. And this is a good one! Thanks for the comment. Hi Pam, you'll enjoy this! Really good stuff. :-) Thanks for the comment. Love your wedding story! Geek wedding or not, it is always nice to remember, eh? And this cocktail is one I know I will like because I have all the ingredients on hand. And as for Skoal...I have all these flavored aquavits in my freezer where they have now been for over 1 year. I can't drink them straight so I need ideas! Hi Abbe, we're not really wedding people (not real bit on ceremony), but our wedding was such a giggle it's fun to remember. :-) Thanks for the comment. Hi Carolyn, i doubt if anything will replace Champagne for weddings, but this would be a worthy replacement! Thanks for the comment. What a delicious drink, just perfect for a wedding. I would love to give this drink a try! Hi Caroline, this is a good one, isn't it? Love its flavor! Thanks for the comment. Hi Peachy, it's definitely worth trying -- very nice flavor. Thanks for the comment. Hi Smitha, isn't this nice? Tastes even better than it looks! Thanks for the comment. What a wonderful toast to the bride and groom. Gorgeous cocktail as usual. I will have my groom of 10 years make me one this hot day of June!! Thank you for a wonderful post and drink. Hi Ansh, you'll love this! Really tasting. Happy toasting. :-) Thanks for the comment. Hi Charlie, we had a fun wedding, didn't we? Definitely different! Thanks for the comment. As always, I love your cocktail recipes and the stories that surround them, and this one is no exception. Hi Jeff, this is a good one! You'd like it, I think. Thanks for the comment. Great wedding story! This cocktail looks like the perfect way to get through a big summer wedding. I might actually have to RSVP to one I have sitting on my desk. Hi Pam, this is definitely the ticket to get you through a wedding! And it's so good you'll want to have it other times, too. Thanks for the comment. What a great story! A perfect (memorable) way to start your married life. I love the wedding story, John! It certainly is memorable, lol. I love this drink but I think I'd leave out the egg white. So pretty and cool looking for summer. Thanks for a great idea! Hi Beth, that really is memorable! And amusing. :-) Thanks for the comment. Hi Robyn, we usually leave out the egg white -- just easier. But it's pretty with it. :-) Thanks for the comment. Hi Rahul, it is, it is! :-) Thanks for the comment. Hi Marcelle, this is a good one. Definitely worth a try sometime. Thanks for the comment. Hi Dana, this is a really good one. Definitely something you won't get tired of! Thanks for the comment. This cocktail is just calling for me...I will try this tonight...simple and so refreshing with the fresh lemon. Hi Juliana, this is a wonderful drink. Enjoy! :-) Thanks for the comment. Love the beverage and the story behind it. All pretty in white; just like the bride! Hi Brooks, this is a pretty drink, isn't it? And tastes much better than it looks! Thanks for the comment. Perfect cocktail especially now that summer is here and temperatures are in their highs! Hi John, that's a perfect cocktail with a beautiful name too. Thanks for sharing the story. Excellent pictures. Hi Katerina, you're so right -- cocktails and summer are just made for each other, aren't they? Thanks for the comment. Hi Amelia, isn't this fun? And it tastes so good! Thanks for the comment. Hi Mimi, this has such a super flavor. You'll like it. :-) Thanks for the comment.